Found in most woodworker’s workshops, as well as in trade shops up and down the UK, boiled linseed oil is a popular product at Rawlins Paints. Also known as BLO (an acronym of Boiled Linseed Oil), this wood treatment is an oil treatment primarily for interior use, which leaves a lovely and smooth finish on a wooden surface – almost with a wet look. Like the kiss of life, it can transform old, worn out and dried wood to better its former glory. Fun Fact: This type of linseed oil used to be a common addition to most paints. Still available from specialist companies, it can still, on its own, be mixed with other finishes. 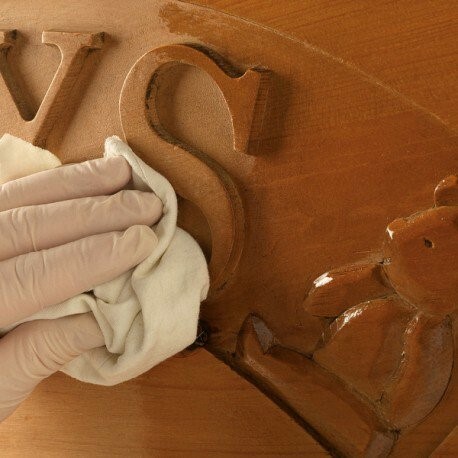 There are other wood finishes that treat surfaces in a different way, such as waxes, which ‘set’ the surface, sitting on it and buffing it to the desired finish. There are also other types of linseed oil, including pure linseed oil and polymerized linseed oil (which has been half treated). Deceptively recognised as a wood treatment, it can also be used on metal. BLO protects wooden surfaces with its deep penetration, soaking into the grain and bringing out added contrast and character. Rather than being a surface treatment, boiled linseed oil soaks deep into the wooden fibres, to the core of smaller depth pieces of wood, strengthening it throughout. Fun Fact: Boiled linseed oil has not actually been boiled, but is chemically modified with metallic solvents for faster drying times. Standard or raw linseed oil can take weeks to dry, sometimes longer – making that the main difference between the two types of linseed oil. It’s not just wood that boiled linseed oil protects, it also helps preserve metal, by protecting the surface from oxidation. Thin coatings work best, as thicker application coatings can take longer to dry and get, what is known in the trade, as ‘gummy’. Generally, only applied to non-moving parts of workshop tools, such as chisels, block planes, screwdrivers or treasured (and no longer used) heirloom tools, it can also be used on cast iron surfaces of bigger tools – table and band saws for example. Boiled linseed oil is applied with a rag, or a similar buffering cloth. This is dipped into the linseed oil and rubbed into the wood – straight up and down the grain, or in slow buffering circles. Gloves should be worn at all time during the handling and application process of linseed oils. Remember, as discussed earlier, to apply thin layers and not at any point by pouring the boiled linseed oil onto a surface. Where possible, as with all paints and wood finishes sold at Rawlins Paints, it is best to test boiled linseed oil on a small area first, before applying full coverage. It may take between 24-72 hours for BLO to fully cure, or dry out to the touch. 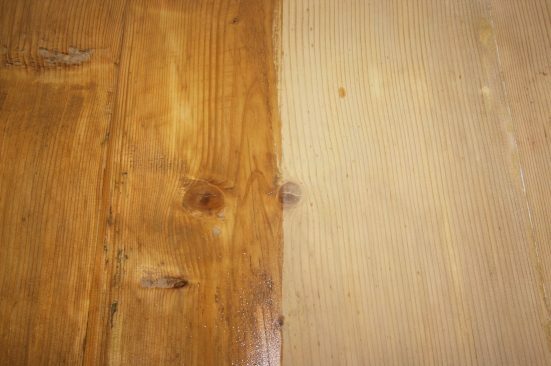 Dry, bare wood is like a sponge and will soak up almost anything applied to its surface, and boiled linseed oil is one of many wood preparation products available, and acts as a good wood sealer to make surfaces much more water resistant. Nearly all wooden surfaces will contract and expand through humidity and seasonal weather, which is where this type of linseed oil is great, as it is flexible and will continue to protect the wood through these changes over time. Similar to some other solvent based products, boiled linseed oil is cured by its interaction and chemical reaction with oxygen. Water based paints and products ‘cure’ by water evaporating, emitting low VOCs and are not heat reactive to the touch. BLO when it dries does create heat, in part of its chemical reaction with oxygen. Because of this there may be recommendations on a product for drying out (curing time) exposure to sunlight or other heat sources (ovens, radiators, naked flames). Chemistry states that lower usage of the product will create lower heat generating reactions, compared to larger application areas and density of the coating treatment creating potentially much bigger heat generation risk. 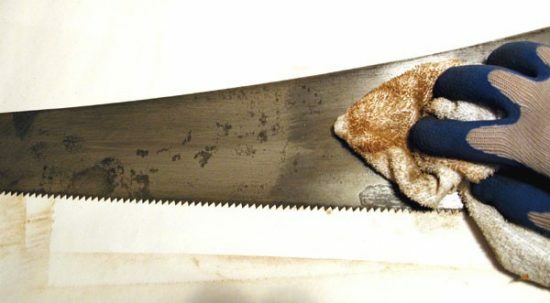 The best technique to prepare a wooden surface for a treatment other than boiled linseed oil is to use sandpaper and a lot of elbow grease. As the oil soaks deep into the wood, you’ll be looking to prepare only the surface’s cured coating, removing as much of the linseed oil as possible. 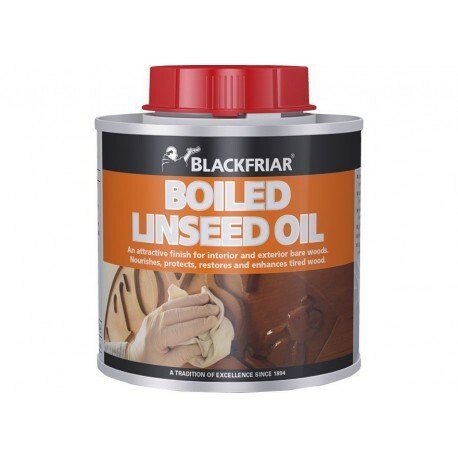 Blackfriar’s boiled linseed oil works very well on most woods, with the exception of oak, and can be used inside and outside on soft and hard woods. Leaving a ruby ‘tint’ to a bare wood surface, it is water resistant and has a light gloss finish. As well as sealing woods, it works as a softener for metal glazing putty. Every workshop should have a canister of Blackfriar’s boiled linseed oil in a cupboard. Boiled linseed oil does come with a strong warning that it is a very flammable material and incorrect storage can lead to spontaneous combustion. All product datasheets should indicate strict storage recommendations – including temperature, humidity, sunlight exposure, etc. for the storage area. If in doubt, please contact us prior to ‘forgetting’ about it and leaving it in an unsuitable environment. Do not store boiled linseed oil in anything but the metal container it is packaged in. For application purposes, plastic containers can be used – for ease of use – but never simply cover and store the plastic tubs. One application method is to use a dry rag. After use, however, lay flat the rag on a non-flammable surface (concrete), away from potential heat/flame sources, until dry. Alternately, like the oil itself, the rag can be stored in a metal container. Never discard a used rag, as this can be a huge fire risk – the ‘screwed up’ and discarded rag can be a lot more heat reactive and combustible due to lack of air ventilation to cool the oil down. Used rags can be flash points, and at all times through the preparation, usage and cleaning-away process, all materials must be considered fire risks if inappropriately used and stored. Fun Fact: When Tutankhamun was buried, the linen clothes that embalmed him were covered in linseed oil – but due to it being a rushed ‘ceremony’, the linseed oil did not have sufficient curing time and it may have spontaneously combusted. Let that be a warning to cleaning out the rags used to apply boiled linseed oil! my sons and I are whittling and carving walking sticks. We’d like to maintain the beautiful natural color of the wood. Which product or oil would you recommend that will both preserve the natural coloration, while also providing adequate protection for the wood? For this, we would suggest trying Timberex Timberguard – more information about the product and its uses can be found in the datasheet attachments on the product page.